Are flexible phones the next big innovation? Look at your phone screen. It’s flat, right? For decades, displays have simply been flat pieces of glass or plastic that dictate the design of our technology. But, more recently, tech movers and shakers have turned to curved displays, a growing number of which can be found on computer monitors, televisions and phones. The question now, though, is: what’s next? After concurring curved displays with devices like the 2013 Samsung Galaxy Round (which would iterate and eventually morph into Galaxy S7 Edge) and LG G Flex, released the same year, manufacturers are looking at bendable displays to push tech design forward yet again. Flexible displays have the ability to be one of the biggest technological breakthroughs of the decade, freeing up designers to create devices we’ve never seen before. While curved displays are impressive, these aren’t the same as ones that bend. Traditionally, liquid crystal displays (LCD) are a sandwich of materials that includes a backlight, polarizer, thin-film-transistor layer, liquid crystals, color filter glass and a polarizer. LCD are typically flat, but a few companies like Samsung have managed to produce curved ones. More recently, organic light emitting diode (OLED) displays have gained popularity because of simplified construction, superior image quality and flexibility. OLED displays don’t require a backlight, so these can be made thinner and molded to specific forms, like the curved display on the Samsung Galaxy S7 Edge. The flexibility, thinness and superior image quality make OLED a better choice for curved displays, and it's clear OLED will phase out LCD in the future. OLED is currently too expensive to manufacture for large displays like TVs and computer monitors, however prices will eventually drop. Although LCD contains more layers than OLED, both of these screens types can still be made to bend. Apple supplier Japan Display announced this week that it’s developing a 5.5-inch flexible LCD display with full HD resolution. The company hopes to make the display by utilizing a plastic substrate, which has traditionally been built of unbendable glass. As impressive as curved screens are, displays that bend push engineering and material science even further. Engineers have to figure out a way to create materials that won’t break under the stress of being flexed repeatedly while maintaining a consistent image across the display. That’s an enormous challenge, but one tech makers are undertaking as we speak. One of the biggest benefits of a bendable display is that it makes gadgets more durable. Phones with bendable displays can flex under impact, so shattered screens may be a thing of the past once bendable ones are perfected. However, it will be some time before shatter-proof phone displays become a reality. The assumption today is that bendable displays will use plastic instead of glass, but plastic itself isn’t invincible, as it can still break if under enough stress. Manufacturers like Corning are currently working on a bendable glass called Willow, which it plans to introduce in everything from phones to TVs to wearables. Willow is about as thick as a piece of paper and can be bent like it, too. However, Willow will still break if bent too far, so there’s work to be done for truly bendable glass displays. 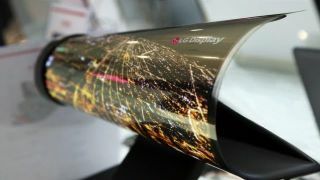 Three of the biggest phone makers are rumored to be experimenting with bendable display phones. Samsung is expected to unveil the Galaxy X foldable smartphone in Q3 2017, according to The Korean Herald. The most notable feature of the Galaxy X is that its display will fold outward, letting users transform their handsets into 7-inch tablets. LG is also said to be coming out with its own bendable smartphone, which would also fold outward to form a tablet. Patent drawings show a LG concept phone that has a foldable display that can be used even when bent. Apple is considering using bendable displays for the iPhone, according to 9to5Mac, but we likely won’t see a foldable iPhone any time soon. Though the tech giant is contemplating using Japan Display’s bendable LCD display in a 2018 iPhone, as reported by the Wall Street Journal, it’s unlikely to adopt such new and unproven technology this quickly. The first step for Apple could be to introduce a curved OLED screen with the iPhone 8, due out this year. It’s current-gen Phone 7 and iPhone 7 Plus handsets feature LCD displays. One of the central questions around bendable displays is, why? Why have a phone or tablet that can be flexed at all? The biggest benefit of a bendable display is durability. Since the screen can be flexed and manipulated, it can also absorb impact better than the solid glass structures we currently have. Other technologies could gain from the new tech as well. For example, wearables could take advantage of bendable displays by contouring to our bodies, like smartwatches that better form around our wrists. Phones, too, could take on a new form factor, like the Lenovo Cplus prototype that starts out as a thin handset but curls into a wearable for the wrist. Samsung already experimented with putting curved displays on its original Galaxy Gear S smartwatch, but moved to a more traditional flat, rounded design for the Galaxy Gear S3. Even the now-defunct Microsoft Band featured a curved display. With a bendable display, smartwatches could theoretically have massive screens that wrap around the wrist to display even more information at once. Cars could also benefit from bendable screens as more and more dashboards are going all digital. For example, the Mercedes E-Class displays its guages and infotainment data on a 12.3-inch HD display that spans across the dashboard. The Tesla Model S and Model X already have a huge 17-inch center display, but could use a bendable display to contour naturally to the car’s dashboard. The concept of bendable displays isn’t new, as gadget makers seem to show them off annually at big shows like CES and MWC, but no one has brought a bendable display to market just yet. Why? Because while making a bendable display is difficult, crafting a device that uses one effectively is even harder. To create a bendable product, manufacturers need to figure out how to make the various components inside flexible as well. Batteries are a particularly difficult object to make bend, as current technology requires batteries keep their shape. When bent, today’s batteries will short circuit and, if smooshed too far in the casing, could explode. Both LG and Samsung have been working on a flexible battery for years, but the technology still hasn’t made it to products yet. So far, the only way to utilize a bendable display is to make a device that bends on a hinge. We sort-of see this concept in action with the Lenovo Yoga Book, which features a touchscreen display and touch-sensitive keyboard that doubles as a drawing tablet. With a hinge, device manufacturers could potentially still use solid batteries and silicon, but add a display that folds, too. We’re still waiting for the first bendable device to come to market, but when it does arrive we can expect durability and endless opportunities for design and innovation to follow. Phone and tablet designs have been stale for the last few years, and bendable displays might just be the thing to make them exciting once again.